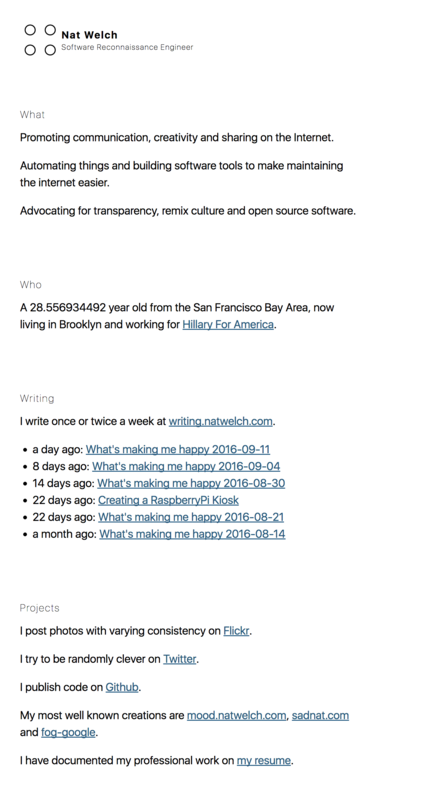 My personal site, natwelch.com, was running a really old version of tachyons. So today I decided to fix it up. I haven't done the blog yet, since that'll take longer, but one step at a time. Pull Request 11 has the diff of what changed, but here it is in pictures. A few days late, but here is a #happy post. I spent most of last week sick. As such digging through my links was difficult since I apparently spent half the time just liking things on Twitter. I had such high hopes for productivity today (Sunday, Day 54). Instead I spent it walking and talking with fantastic people. Breakfast and Lunch were in Park Slope with the thoughtful @saturnial. Between Lunch and Dinner, I enjoyed the company of Courtney, who walked with me from the Williamsburg Bridge to Grand Central Station. And then I had a wonderful dinner with @frewsxcv. Finally, in an attempt to avoid the still broken D train, I decided to take an UberPOOL (which I hadn't taken since I left SF). I was matched with @pierrevalade, who was an absolute delight to talk to about software and big companies. Yikes, I missed #tenbysix update number fourteen. sadnat.com. All that bravado in number thirteen, and then just ball dropped. Nat? Nat. Nat! 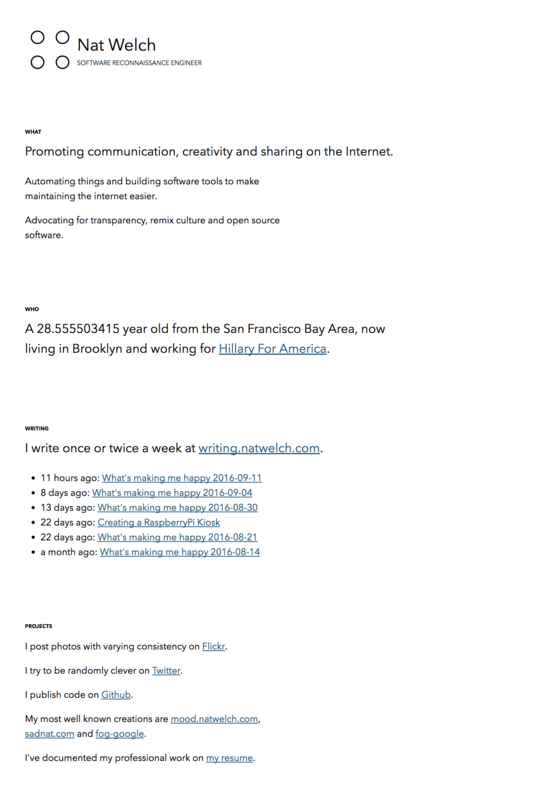 is the blog of Nat Welch. Want to become a better programmer? Join the Recurse Center!